James McDevitt was born into a large Irish family around the year 1845. 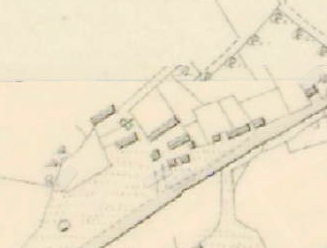 His home was in a small cluster of houses– known as a clachan– which operated an infield and outfield farming system known as rundale (see here). James grew up cheek by jowl with not only his own siblings but a number of other children from the Harkin, Toner, Quinn and McCormack houses which surrounded his own. The small settlement they inhabited was on the south bank of the River Swilly in the townland of Drumenan, near Glenswilly, Co. Donegal. Drumenan was marginal land, with only a few well-drained fields in a locality dominated by bog. Prospects were few and far between for the McDevitt children, and it was inevitable that the family sundered on the rock of emigration. While some of the McDevitts remained in Donegal, others set out for New York. James was 21 when his turn to leave came round in 1866. Through his life, he had enjoyed an especially close relationship with his father Patrick. As he was about to set off, Patrick took his son “out between the buildings” of the clachan to impart some final advice. Neither knew if they would every see each other again. James left for the emigrant boat with the words still ringing in his ears. There were many he was sorry to leave behind, but perhaps none more so than his niece. The girl he had always referred to fondly as “little Grace”–even though she was only a few years his junior– was one of those to tearfully wave him off. It is not clear what James chose to do in his first years in America, but his first port of call was certainly with family, probably his brother. By the 1870s he had determined on the military life. He became a member of the United States Marines, and was soon deployed on long voyages to far flung destinations. His profession made it difficult for him to keep in touch with home, as he would often be at sea for months or even years at a time. Even so, James wrote when he could. This was despite the fact that, like nearly all his family, he was illiterate. But as we have seen countless times before, literacy was no barrier to either writing or reading letters. James had different comrades pen his correspondence home for him during his service. His letters imparted news about the McDevitt family in America, and sought it from the McDevitt family in Ireland. 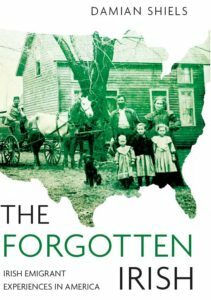 The topics he covered were typical of those covered by American emigrants when writing to rural Ireland in this period. James often specifically addressed multiple family members in a single letter, a tell-tale sign that the correspondence was communal. After it arrived in the Drumenan clachan, family and friends gathered around as it was read aloud by a literate relative or neighbour. Another feature of James’s letters was his feeling of responsibility to those left behind, also common in emigrant correspondence. While in America he sought to fulfil these obligations by remitting money and by paying the passage of other family members to the United States. The McDevitt story is typical of the working-class experience of nineteenth century Irish emigration. What makes it special is that we have some of the detail which helps bring that story to life. The location of the McDevitt home as it appears today. 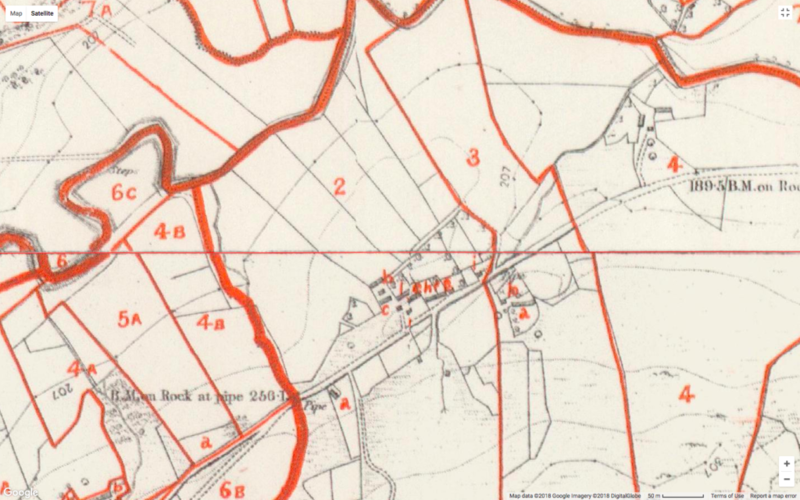 The Clachan no longer exists.Of the 13 family names recorded in the townland in the mid-nineteenth century, only six were left in 1901.The McDevitts were not among them. When James first joined the Marines they physically described him. He was said to be 5 feet 7 inches tall, with grey eyes, brown hair and a ruddy complexion. By 1877, he had been assigned to a new vessel, the USS Huron. An iron-hulled screw steamer with a full-rig auxiliary sail, she had only been launched at the end of 1875. On the night of 23rd November 1877 James left Hampton Roads, Virginia aboard the Huron, bound for Cuba. They had barely left before they were truck by a deadly storm, gusting from the south-east. At around 1.30 in the morning Huron ran aground at Nag’s Head, North Carolina, just 200 yards from the beach. Although they were almost within touching distance of safety, the dreadful conditions prevented most of the more than 130 men aboard from reaching shore. As waves lashed the ship, they desperately clung to the wreckage and waited for help to come. It never did. The lifestations along the coast were closed that November. As the hours passed, some men reportedly lashed themselves to the hull to prevent themselves from being swept overboard. But the strength of more and more of the men failed, and they were gradually washed overboard to their deaths. One wave alone cast at least 12 of them to their doom. 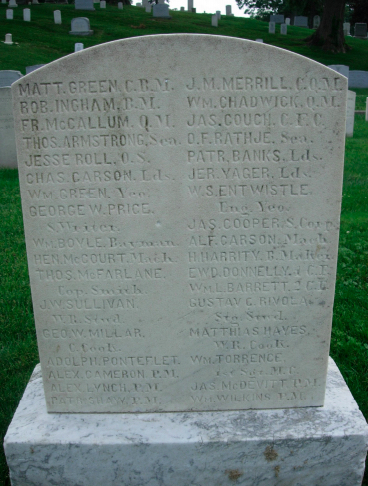 In the end, 98 men perished– one of them Private James McDevitt. The remains of those men who were identified were taken to the United States Naval Academy Cemetery in Annapolis, Maryland, but unfortunately James’s body was not among them. Today his name is remembered on the rear of the Huron memorial in the cemetery. Perhaps mercifully, James’s father Patrick had not lived to hear of his son’s premature death. He had passed away in Donegal on 14th March 1875 after a long illness. James’s mother Mary was still alive, and she attempted to secure an American military pension, an effort that ultimately proved unsuccessful. In her appeal she recorded that she owned only a “piece of mountain land” that was valued at £2 annually. Her home was described as a “small cabin.” Because James was no longer remitting money from America, she was “now in debt to my neighbours for foods and money…” Some of those neighbours gave evidence on her behalf, remarking how she only had 2 acres of arable land. Mary McDevitt also enlisted the help of her family in America. There to coordinate those efforts was “little Grace.” James’s favourite niece had emigrated to New York, and it seems it may have been James who paid her passage. In fact, he had spent his last three days leave with her before heading off for what proved the final time. The 1880 Census records Grave at 260 4th Avenue in New York, where the 28-year-old was working as a chamber maid. She was living with 15 other Irish chamber maids and an Irish-born cook, and was one of the few who could neither read nor write. Even so, she went to great lengths to secure the documentation her grandmother in Ireland needed. This included statements from other members of their Donegal clachan who now lived in America. 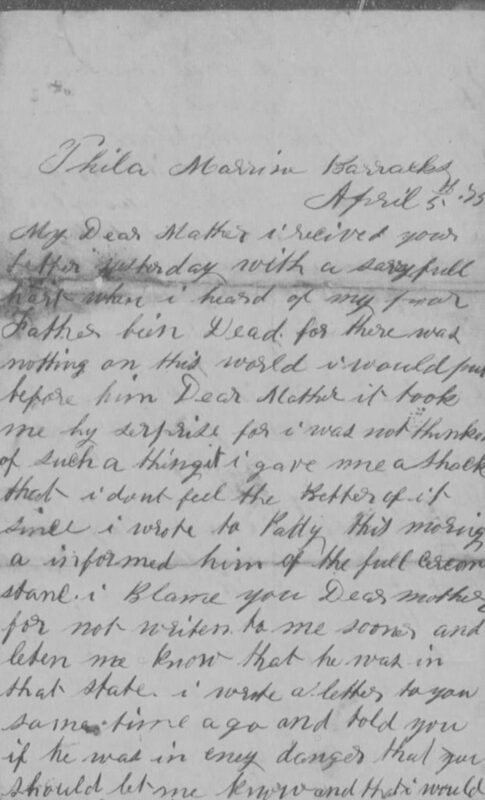 But the Pension Bureau remained unsatisfied, and eventually asked Mary McDevitt if she had any letters from James. She duly sent them to Washington D.C. from Donegal, where they remain preserved in the National Archives. Unfortunately she never received a pension. The five letters, which offer such an intriguing insight into the emotional toll of emigration, are reproduced in full below. The wreck site of the USS Huron is now a popular diving spot. The Town of Nags Head tells her story here. Dear Father and Mother I now take this favourable opportunity of writing to you to let you know that I am in good health thank God for it. Hoping you are all enjoying the same great blessing. Dear Father and mOther you must excuse my not writing before this. Dear Mother I am just after making a three years and a half cruise through Southern America. Dear Mother I am only here at this post one month and I will perhaps remain here the remainder of my enlistment unless there is some chance offered for a transfer to some other post. My time will be out in September 1875. Dear Father and Mother I have not forgotten you yet. Dear Father and Mother I never knew about what it was to want a Father and Mother until I cam to this Country. You must let me know in your answer to this letter how you are getting along. Dear Mother I wish to know how sister Mary and husband are getting along because I know that she is raising a large family and I know it must be pretty hard on her. Give my love to her and tell her that I have not forgotten her yet and I will do something for her and also let little Grace know that her Uncle has not forgotten her yet. Tell her if she wants anything from her Uncle to not be backward in asking for it. Tell her if she wants to come to America to just let me know, let her know that I will pay all expenses. Dear Mother I ave thought of going home and if she would wait until my time was out I would bring her back to America along with me. Dear Father and Mother I will never die until I see you and put my arms around your necks. I never lie down at night but I think oy you for I know you are the same way about me and especially every set night for I feel bad myself you may be sure. I will send you a present for Hallow Eve Night and I am sure it will make you laugh. I have got two letters from brother Patrick since I came here and he is in good health. I was also in brother Daniel’s some time ago and himself and wife were well he was a very kind brother to me. Give my love to brotherJohn and Edward and wife tell them I have not forgotten them either. Give my love to aunt Mary and husband and tell cousin Alice and Mary and Mary’s husband and let them know I have not forgotten my boy yet. Dear brother Edward let me know what became of your daughter Ann as the poor little thing has got no mother. Give my love to all my uncles and aunts and my best respects to all inquiring friends. Dear Father and Mother I now take the present opportunity of writing you these few lines to let you know that these leave me in good health hoping this will find you all enjoying the same blessing. Dear Father and Mother I received your kind and welcome letter on the 18th of September and was sorry to hear that my poor Father was so bad. I have not felt well since I heard of him being so bad and I asked the Commanding Officer if he would recommend me for a special discharge and he said he would not because he was too short handed and when he refused me I did not know what to do. 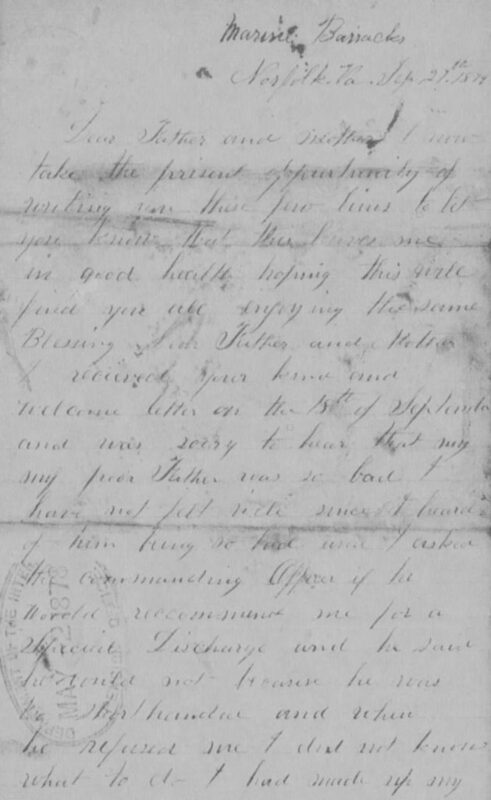 I had made up my mind to desert and go home but the boys tell me that I would lose a great deal by deserting and that I had better stop and I think it is better for me to wait until I get another letter from you to see what you advise me to do and if you would advise me to come home I will leave the Marine Corps. 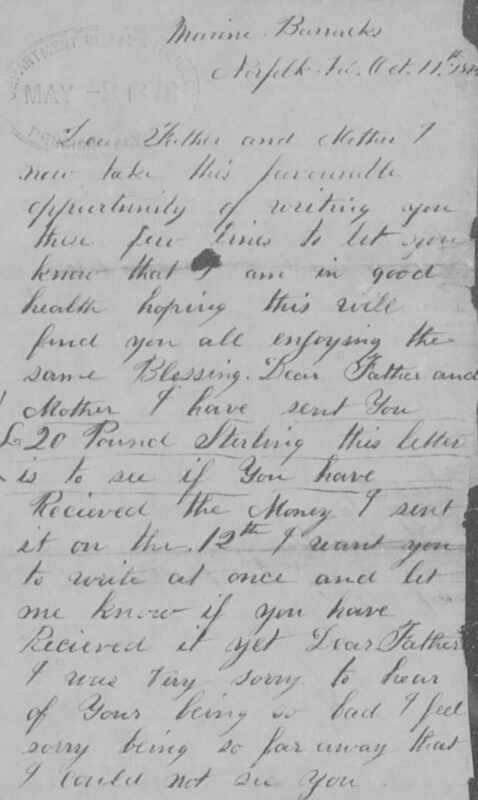 Dear Father and Mother you must excuse me for not sending you some money in this letter I have not received no pay as yet except when I am going on liberty but I will get my pay on the 10th of October and then I will send you 20 pounds. Dear Father let me know how much you are in debt. Dear Father don’t think I am leaving myself poor by sending you the money for I could send you 60 pounds as well as 20 after pay day. Dear Father and Mother do not shed a tear for me for I am all right. Dear Mother I want you to handle the old man as if you were handling eggs and give him everything he wants and all expenses will be paid by me. Dear Father you stated in your letter that you though you would not be able to pay your debts before you die well you need not be afraid of that for I will pay all your debts. Dear Father if you be dead I never will come home for I can’t it would break my heart. You may be waiting for the money on the 26th of October. Dear Father I heard that brother John is not doing right. Dear brother John if you don’t like to stop with your Father and mother if you are not satisfied with them write to me and I will bring you out. 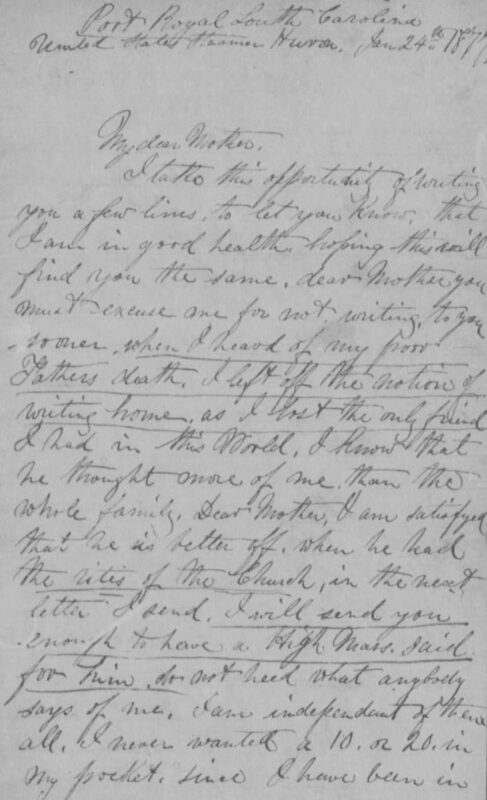 Dear brother John I want you to take good care of my poor Father and if you want anything at all I will send it to you. Give my love to all my brothers and sisters and my best respects to all my friends and well wishes. Dear mother you talked about selling your land do not sell for your life for it will come good some day I will take care of you. Write as quick as this comes home. Dear Father and Mother I now take this favourable opportunity of writing you these few lines to let you know that I am in good health hoping this will find you all enjoying the same blessing. Dear Father and Mother I have sent you £20 Pound Sterling this letter is to see if you have received the money. I sent it on the 12th I want you to write at once and let me know if you have received it yet. Dear Father I was very sorry to hear of your being so bad I feel sorry being so far away that I could not see you. Dear Father I do not forget the words you told me between the buildings yet. Dear Mother I felt good when you said that you had stored it so well yourself. I receive a letter most every day from my cousins they are all well and told me to send you their best respects. I must now bring my short letter to a close by sending my love to my brother and sisters uncles and aunts and my best respects to all inquiring friends. write as soon as this comes to hand. Write soon. Address James McDevitt, Marine Barracks, Philadelphia Navy Yard, Penna. I take this opportunity of writing you a few lines, to let you know, that I am in good health, hoping this will find you the same. Dear Mother you must excuse me for not writing to you sooner when I heard of my poor Father’s death. I left off the notion of writing home as I lost the only friend I had in the World. I know that he thought more of me than the whole family. Dear Mother, I am satisfied that is better off when he had the rites of the Church. In the next letter I send I will send you enough to have a High Mass said for him. Do not heed what anybody says of me, I am independent of them all. I never wanted a 10 or 20 in my pocket since I have been in the Country, and if you ever nee it I have it for you also. Dear Mother do not think that your son James has forgotten you. My feelings are more tender towards you now than they were when I left home. You must not think that soldiering here is the same as home for a soldier here makes more in one month that an English one would make in a year. The pay is equal to £5 or 25 dollars per month here and we get our clothes & board. Also, on account of the hard times here I thank God where I am. Many a poor man would be glad to have the same chance if they could for there are plenty of our Country men and women starving in the streets. There was never known such times in America before. My brother Patrick and Daniel are well. I have got little Grace’s likeness and she is well and she said that she wanted to see her Uncle James very bad, because I called her little Grace, and she told me to not call her little Grace, that she was big Grace now, and said that she was counted as good a looking girl as was in New York. P.S. Direct your letter to James McDevitt, U.S.M. Corps, U.S.S. Huron, Port Royal, South Carolina, U.S. America, or elsewhere. *None of my work on pensions would be possible without the exceptional effort in the National Archives to digitize this material and make it available online. A team of archivists from NARA supported by volunteers have enabled access to this treasure trove of historical information. To learn more about their work you can watch a video by clicking here. James McDevitt Dependent Mother’s Application (Disapproved). State of North Carolina. USS Huron Shipwreck Preserve. Thank you very much for sharing your exhaustive research on this most excellent website! I was born in Annapolis, MD and have made frequent trips to the US Naval Academy over the years, but the humble Huron memorial and its tragic story escaped my notice. How wonderful that you have brought this story to light! I will certainly stop by to pay my respects to the memory of poor James McDevitt and his fellows. I am deeply interested in the life and career of Bvt. Lt. Col. Joseph O’Keeffe, who is best known for his friendship with Myles Keogh. I know that Robert Doyle has done a great deal of research on Keogh. Do you have Mr. Doyle’s contact information? I would like to share my O’Keeffe research with him. Thanks for the comment and really glad you are enjoying the website! Annapolis is a beautiful town! Joseph O’Keeffe was fascinating character- I will send you on Robert’s details!